Real estate blog SeattleBubble runs an occasional series titled Cheapest Homes, where blog author The Tim finds the cheapest homes in Seattle. I love this month’s cheapest house. $136k, 0 bedrooms, 360sf. Apodment meets single family home. With a 30 year mortgage assuming no down payment and 4% interest that’s $650 a month (well, plus taxes, insurance, and utilities unlike aPodments). Not nearly as walkable as aPodments, but you get quite a yard (there’s more behind the house). Note that the 3,000 sf of land it’s on, that could fit more than 8 of these cottages, is well under the nominal minimum lot size for Seattle of 5,000sf. You simply couldn’t build on this “small” of a plot of land without being grandfathered in. Of course, in a logical world we’d let people build, say, 4 of these on that piece of land, each with up to a 390sf yard, and this would tend to make them even more affordable. If enough people wanted this type of housing it would boost densities in our single family neighborhoods without changing their character, which could lead to better retail nearby and better transit. Seattle’s coming to a reasonable compromise on our rules for some new small homes, allowing them on lots as small as 2,000sf* in exchange for not allowing them to be built tall. But I’d love to see us go further and remove minimum lot sizes for tiny homes like these. * But only for plots that were created before 1957, with the correct documentation. This does not change the minimum of 5,000sf in most cases, and you can’t simply divide existing lots. Instead of fantasizing about cramming 8 hovels onto a lot, why not think about the reasons why people would prefer living in crappy separated houses instead of living in existing apartments? Here’s a good starter list: noise, noise, noise, tragedies in the common spaces, lack of storage, poor maintenance and noise. Fix those, and you’ll see people abandoning crappy houses for nicer apartments. On the contrary, people do want to live in Seattle apartments and condos. But around 70% of Seattle is made up of single family zoned land, and our multifamily zones share the remaining 30% with our universities, commercial zones, industrial, schools, our airport, etc. We should absolutely keep working on increasing allowed building heights and floor area ratios in our multifamily zones, but if we want to allow more people to be able to afford to live in Seattle it’s important to find ways to add homes to SF zones. It seems to me that small homes is one way to do this that doesn’t bring a large impact to existing neighbors. As a side note, Seattle has fairly good codes regulating the acoustic features of walls and floors between apartment units (at least in high-rises, I’d have to check for low-rise). That’s excellent, then. I’d love to see the references… some other cities could use such codes. Here’s Seattle’s code (Section 1207), and here’s the International Residential Code (the code that Seattle uses as a base, as do many other cities). Note that this section of the IRC is optional unless specifically called out, which Seattle does. Also note the IRC criteria is a Sound Transmission Class of 45, whereas Seattle lists 50 if you’re relying on manufacturer’s data or it drops to the standard 45 if you actually test the noise transmission. There are some fifteen apartment buildings under construction on Capitol Hill and another fifteen in planning. These developers would not be building them if they didn’t expect them to fill up. The era of loose lending and imaginary rich customers ended five years ago. There is a reason why I have suggested “noise wall” rules in apartment buildings. Why are older apartment buildings often more attractive than newer ones? Primarily, thicker walls. Matt, not everyone wants to live in a apartment in Seattle. In fact, a lot don’t want to! All because of the reasons “X” listed, beleive it or not. Of course not. But we don’t need to “see people abandoning crappy houses for nicer apartments” – there’s already a strong demand for apartments in Seattle. And for houses in Seattle. There’s plenty of demand all around to live in Seattle, and we need to find a way to meet this demand unless we want to keep pushing people out to the suburbs. Every new home we build in Seattle – be it a cottage, a townhouse, or an apartment – means one more household can afford to live in the city. The demand for single-family housing is so insatiable, in fact, that the city government has to actively prevent people from tearing down all the multistory apartment buildings in Seattle and replacing them with single-story houses on large lots. Since they’re not allowed to build really short buildings, there has been a rush to tear down the really tall buildings and replace them with shorter buildings. Hopefully the city council can arrest this travesty and impose minimum height limits. After all, the prices that people are willing to pay are a poor guide to what people actually want. If not for the city zoning code, Seattle would be the next Maple Valley. Thank god it will never happen. First off, this property is zoned SF 7,200, so if the lot weren’t already there, you could only go down to a 7,200 square foot lot. Second, not everyone wants to live in multi-family housing. Many want some privacy from neighbors, a quiet neighborhood, a yard for their kids to play in (or BBQ with friends, or plant a garden). It’s perfectly ok to segregate the city out into single-family zones, where the city prevents the neighborhood from becoming too dense, and urban villages, where density is encouraged. I agree that not everyone wants to live in multi-family housing. That’s sort of the point of my proposal – allowing more single-family homes in our single family zones. I’d further the argument and say not everyone needs a large yard or a large house, but do want a single family house in a single family neighborhood. There are currently options to rent a backyard cottage, why not allow people to own a small-lot small home? The problem is that supply and demand are unbalanced. A third of people want to live in a single-family neighborhood, a third want a walkable/transit-friendly multifamily neighborhood, and a third could go either way. But 80% of America’s housing stock and construction is single-family houses. (Leinberger, “The Option of Urbanism”) That’s as of the mid 2000s so it may be slightly better now, but not enough to change the numbers yet. That leaves 13% of people who are living in lower density than they want. And 66% who would be willing to live in multifamily-walkable-transit density if that’s all that were available. Add to that the retiring baby boomers, and teenagers who are more interested in the Internet than drivers’ licenses, and you can see the demand trend increasing further. Note that walkable/transit-oriented density can include anything from row houses with corner stores on up; it doesn’t have to be all 10-story buildings. Anthony and X you also have to realize that many Seattleites do want to live in apartments and condos. Many people that actually give it a try quickly realize those problems you listed weren’t as big of a problem as they expected. I live on 5th ave in a wood dram building and I really don’t hear a lot. It’s well maintained. My parents bought a condo in SLU, they were skeptical at first. Now they’ve lived there for 4 years and would never consider going back to their old life style. You could actually build apodments in Single Family zones. What is to prevent you from building an 8-bedroom, 3,500 sq. ft. McMansion on any existing lot? Why does the City care if each bedroom happens to have an en-suite bath and a mini-fridge? Put locks on the doors, rent out the rooms individually as you see fit. There are a lot of places in the U-District like that. The average price per square foot for a Seattle home is $360. This home is $378/SqFt. So in one sense, this house is overpriced. I think the picture is showing the wrong house. The house for sale is the gray one behind the white one, from what I can tell. Yeah, that’s right… check out the shape of the lot on Redfin. The recent crosscut piece on DADUs mentioned that during some part of the wartime housing boom when people were moving to Seattle in large numbers for war industries a bunch of lots were subdivided and cottages built on them, as this was a cheap, fast way to get housing built. I wonder if this cottage was originally built during that time. This part of Seattle has some really deep lots… of the 3000 square feet of this particular lot, maybe half of that is a narrow strip of driveway. This lot plus the one just south of it that it was probably split off of add up to around 10,000 square feet. The neighboring lots must be huge. Anyway, the two houses on 10,000 square feet give the same density of housing units as many SF5000 zones… except these houses are both small because so much of the narrow lots’ areas are used for back yards and driveways. Great catch. It’s probably not the best shaped plot of land for breaking up further. But the point remains the same. There are plenty of rectangular lots you could place 2, 4, even 6 of these homes on and not make them feel out of place in a SF neighborhood. So… you’re going to build a handful of small houses on a lot. If you’re building multiple housing units on a lot without a lot of street frontage you’ll need to provide off-street parking (I think there’s a law about it, and if one of the constraints is not feeling out of place then creating a parking crunch is certainly out of bounds), which takes up space, and then there’s building access and yard space… Suddenly empty ground space is at a premium (like it or not, without a yard at the front and back of the lot you’ll feel out of place in many neighborhoods). So you’ll cluster the parking together, and then the buildings together, for space efficiency. With the buildings clustered together, you might as well combine their walls. Bam: townhomes. Townhomes! That article focuses on tall townhomes on normal-sized lots, but there are various shorter townhomes around Seattle as well (my friend used to rent a one-story townhome near Green Lake). Excellent post. That house (and the one behind it) are not too far from where I live. There should definitely be a lot more small houses on small lots. Developers should encourage this sort of construction over really big houses on big lots. Those big houses are much more out of character for the neighborhood than little houses. But generally speaking, the big houses are OK with the zoning laws, but adding new little houses isn’t. Even the restrictions on height seem to apply to skinny houses, and not houses in general. I can understand why someone doesn’t want a tall house right next to their window, but why not just pass general restrictions on height or distance to existing homes (on different lots). You could still squeeze in a bunch more houses that way. Those types of houses would be really popular, too. Houses in smaller lots closer to the main part of the city tend to be more expensive, just because the neighborhood is more desirable. Lots of people buy a much bigger house and a much bigger yard because that is the only thing that is available (in those neighborhoods). They would prefer the smaller lot, but it just isn’t available in their price range. The end result is people buying houses much further away from the center of the city and having to deal with a much bigger lot than they want. 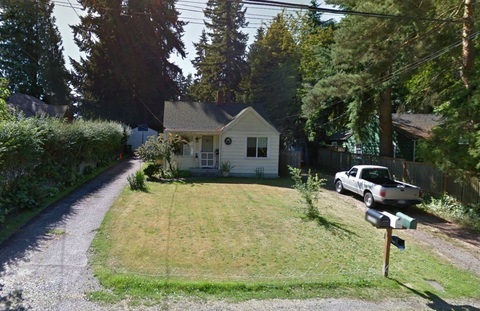 These sorts of houses in those sorts of neighborhood (the ones that are in the Seattle city limits but not the old Seattle city limits) would be a great way to add density. It is amusing, but the cheapest home in Seattle is close to the national average for a standard home! That garage is bigger than my apartment! Speaking of divided lots and closely-spaced houses, I walked by this not so long ago in Kirkland. This is part of a ~45000 sq. ft. lot being divided up for 15 pretty big new houses going for around a mil each. What (a lot of) people want is their homestead exemption tax benefits and fee simple ownership with none of the legal structure of a condo association. Also, they don’t want homeowner dues. You can rent a similar place out on the coast in the extremely-planned town of Seabrook. They start at $109 a night to rent. They do have a bedroom in the back, in addition to the loft area. Or, you can buy a 1-bedroom townhouse that’s still under construction, for about $350K. But, there will be homeowner dues.